The NFL spiced up the normally staid Pro Bowl week with its first ever skills competition. Some of those skills were, predictably, boring (e.g: throw a football over there, catch a bunch of footballs), but a few were much more fun than expected. The NFC beat the AFC 3-2 in the five-challenge gauntlet, however, if you only count the cool challenges, they swept the pitiful AFC 2-0. The competition was pre-taped and all over in an hour. The drone drop, which seemed like it would be fairly rote and easy, was far more entertaining than I anticipated. Turns out that a ball dropped from the height of a 12-story building gets going pretty fast by the time it reaches the ground. Odell Beckham Jr. won it over Jarvis Landry after he was the only one of the pair able to catch the ball after a 125-foot drop. 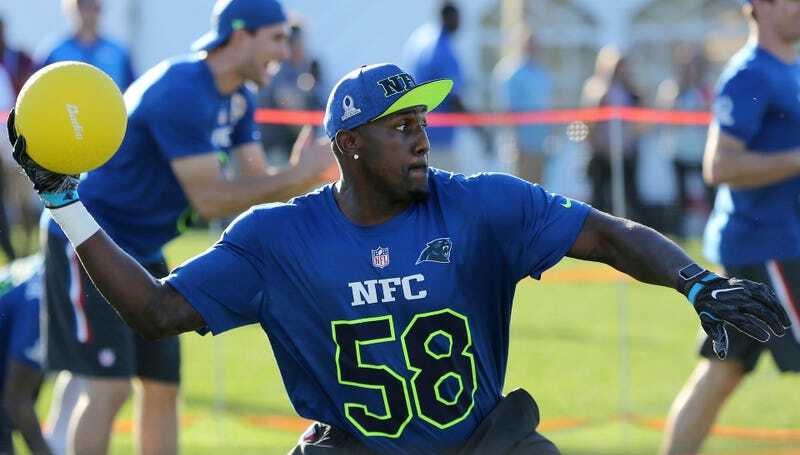 The marquee event of the evening was dodgeball, which the NFC once again dominated. Alex Smith and Andy Dalton were notably pathetic while T.Y. Hilton was the only player who appeared fired up to dodge some balls. If Ezekiel Elliott’s frenzied celebration afterwards is anything to go on, the NFC Played Tougher and Wanted It More, clearly traits that carry over from the football field to the dodgeball, uh, rectangle. Patrick Peterson got some good footage of the game with one of those cameras you strap to your head. They should just cancel the fake football game this weekend and have both rosters play a huge game of dodgeball.